It’s difficult to find someone who just hates the original Star Wars films. Either you like it or you just haven’t seen it yet. The People vs George Lucas airs the long-labored arguments that Star Wars nerds have been making since Lucas made Greedo shoot first–but the film is accessible, and still hilarious, to the wider community. The film looks at the love/hate relationship between George Lucas and the original fanbase he gained back in 1977 with the release of Star Wars. The film takes the traditional documentary route, with talking heads, archive interview footage of Lucas, and film clips. However, it also includes fan submitted videos explaining how they feel about George Lucas. The way the story is fleshed out is the true hook. 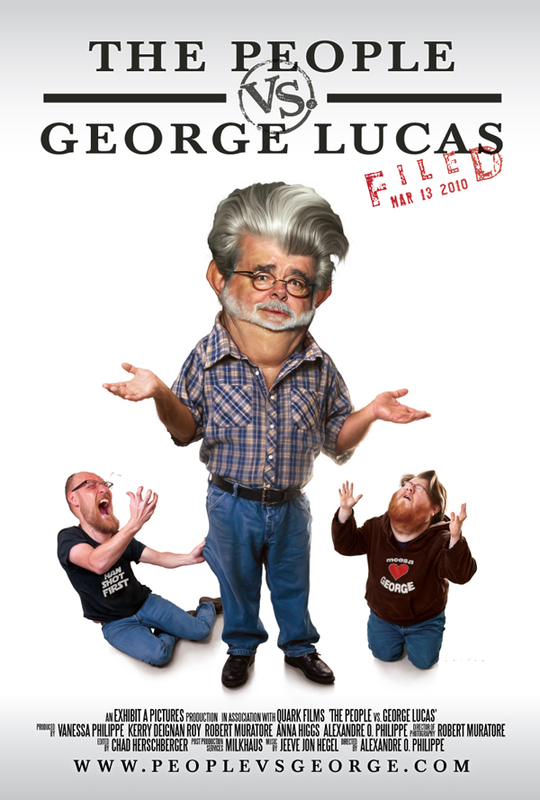 Lucas’ work before Star Wars is presented to showcase his power as a filmmaker (THX 1138, American Graffiti), and to then contextualize the ensuing years that would be solely dedicated to Star Wars. As the chronology moves closer to the present, the nerd rage get a chance to shine: contributors rail against Lucas’ decisions to digitally change scenes (now Han Solo doesn’t shoot first, so as to make him less of a “dark” character), to add items to scenes, and his refusal to allow fans to have a theatrical cut of the film. Then of course the prequels are brought up, and you have a complete platform of complaints that fans across the world hope Lucas will hear. The film is at its most thought provoking when dealing with the issue of the competing wishes of filmmaker and consumer; the documentary also points out that George Lucas himself argued against the colorization of black and white films on the same “cultural significance” grounds that his fans state as the justification of releasing a theatrical cut. Though the film deals with Lucas’ conversion to the Dark Side, it is quite fair in its treatment of the man. This could have been a vitriolic piece of hate-mail bubble wrapped with nerd rage, but instead treats the Lucas like a human being. Or better put, a drunk uncle everyone loves because he’s family, but really hates for the grief he’s caused. Either way, it’s classy in a way you never thought fanboys could accomplish. Though there were too many commentors, that were then cut too brief, the film is funny, intelligent, and a delight to watch, particularly due to the fan films. Now to see if it can get a response from Lucas. This entry was posted in Edinburgh International Film Festival, Reviews and tagged American Graffiti, Art, Edinburgh International Film Festival, EIFF, George Lucas, Indiana Jones, Library of Congress, prequels, Sci-Fi, South Park, Star Wars, The People vs George Lucas, Theatrical, THX 1138, Uncut. Bookmark the permalink.